Resister in the Rockies – by Ironwill The line between military and ‘peace officers’ ‘Law Enforcement Officers’ continues to be blurred. 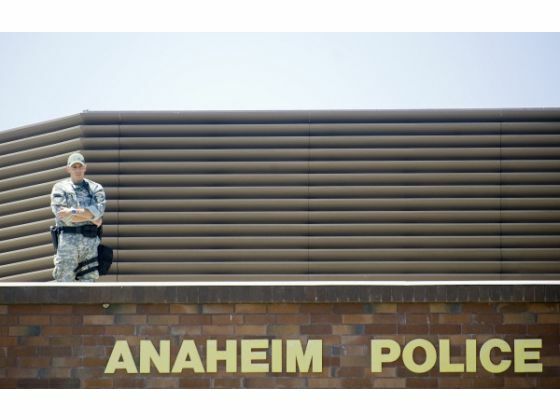 Latest example is Anaheim, California; Home of The Happiest Place on Earth. 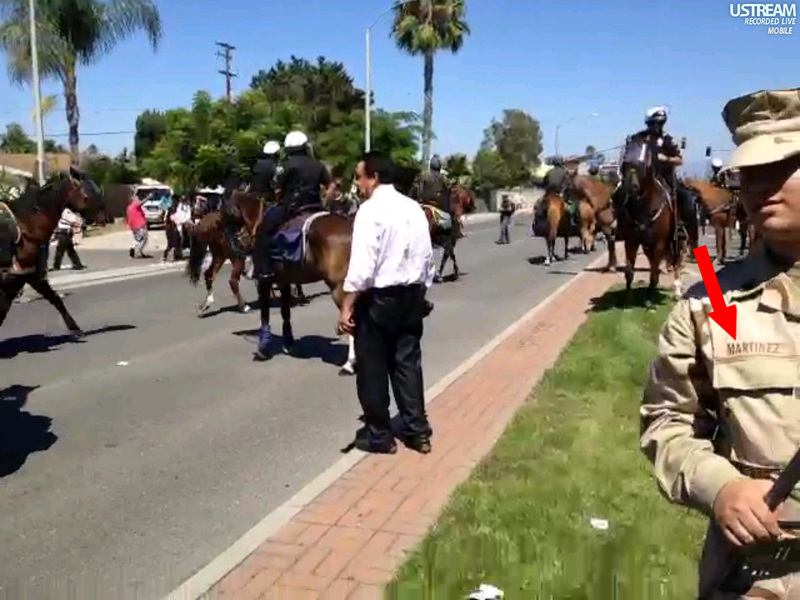 In an effort to prevent protestors from reaching Disneyland, who were marching against the shooting of an unarmed man by the Anaheim police, horse mounted patrols and officers in full ACU (Army Combat Uniform) battle dress were sent out to quell the march. The march appears to have been co-opted by by a couple of commie and socialists groups from Los Angeles. Regardless, is this what our ‘Peace Officers’ ‘Law Enforcement Officers’ have become? What the hell are they doing in ACU’s? 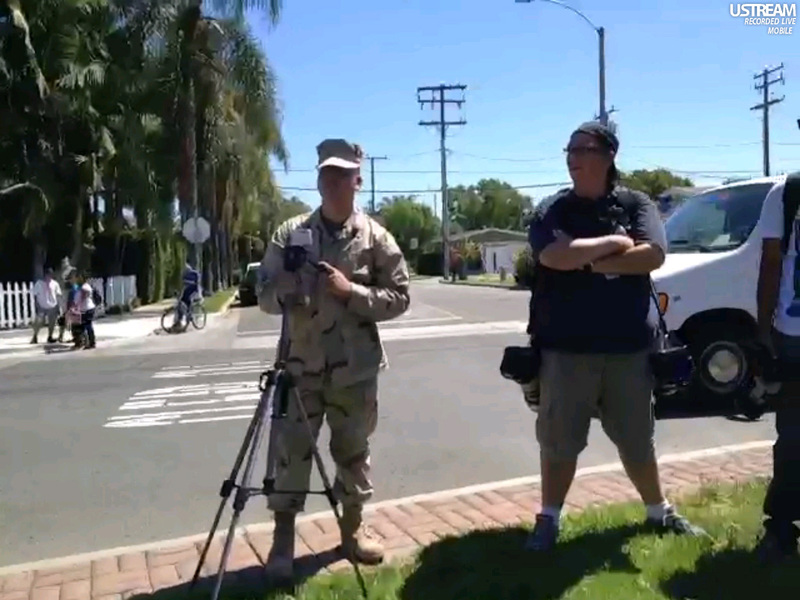 And who the hell is this guy and why is he video taping? There you go, #1 NWO Htr. They’re pretty QUICK on the DRAW, ain’t they? This is only a “dry” run for the real thing…..unless the people do something real soon the FEMA camps are going to be full of fools. Ponce, I seriously doubt the FEMA death camps will ever reach full capacity – they’ll be eliminating fools almost as fast as they can bring them in, most likely. I think many of them can’t get a peaceful job, (vets,etc), and the ominous hardware will surely impress the chicks. Seriously, I feel sad for any employee of the police state. The moral function has been brainwashed out of most of them. 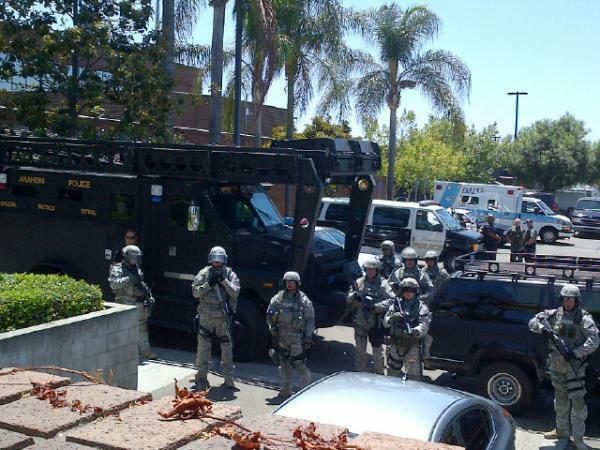 Community policing, (as in 50 years ago), yes, SWAT teams, no. This is not a dry run for the real thing, dang, wake up. This is the real thing. As tensions increase, and people display a greater capacity to refuse gov’t sponsored abuse,… our “kind and compassionate gov’t” will suppress protests with greater and greater brutality! 1) To halt, and disburse the protest. 2) To impress upon Americans “who is in control”. 3) To further extend the Police-Terror-State into American life. 4) To agitate American into open confrontation so that blinding and lethal force may be applied on a wide scale, and provide the excuse for Disarmament &/or Martial Law, even if its localized. Life in America is NOT about our RIGHT to pursue our desires or achieve goals we set for ourselves,.. it has been reduced by a TREASONOUS and TYRANNICAL Gov’t to suppressing Americans at every turn, no matter how justified the protest, and reducing virtually all Americans to obiedent slaves. It is time to abolish this perfidious and treasonous gov’t,.. just as Jefferson told us we would need to do at some point. That point is upon us. JD – US Marines – Time to abolish treason, and restore the Republic. Boy, I can’t imagine how hot those guys must be feeling with all of that unnecessary gear on them. It must feel like 120 degrees to them in Anaheim. Especially this time of year. What do you think, JD? Being a military veteran, you would know all about that, right? It can’t be fun for them in that weather. And the thing is, it’s all completely unnecessary and the military is suffer with it, no thanks to our government. However, it is THEIR choice to be there, so I am not going to be sympathetic to them about it. They screwed themselves over. Your right about being cooked when wearing that amount of gear! Whats worse, is the cameys are like a light canvas material, and being a color that abosrbs heat, as the sun beats down on you,… the uniform heats up even though your sweating like crazy. It not fun or comfortable,.. but for short duration engagements with minimal activity, its a negligible factor. If your going to be doing a lot of running, climbing and crawling, fighting,….. thats a different story,.. heat stress takes it toll farily quickly. As for these guys being there by choice,.. well,.. most of them are following orders. Many of them might have no idea as to the background of why they are getting called there,.. I can’t say I fault any of them for following orders at this point. The real breakdown is by the people who issued them the orders to go there. Now when the this tension between Americans and our treasonous gov’t goes kinetic (the shooting starts),.. and these guys get sent,.. at that point,.. they are FULLY accountable if they fire on Americans, rather than side with them. Problem is,.. since there is no central organization for the Patriots, you will only see confrontations occuring as localized events, rather than nationally, which makes it fighting a riot,. instead of supporting the Restoration Of The Republic. Two distinctly different events in character. Our treasonous gov’t will keep trying portray protests and small collective groups that decide to engage the Fed Gov’t, as looters and criminals, which from the military sent in point of view, might appear as just a bunch of rioters,…not Patriots. Make no mistake,… we are in a minefield right now,.. and must be exteremly careful in how Americans react, lest the FEMA Camps get filled with some people who would be willing to fight the tyranny we are slowly being crushed by. Thanks for the insight, JD. Good to know. Hmmm, where have I heard this before? Of course it is necessary, it is for intimidation to show the protesters how serious they are. Until protesters learn to use their rights these protests are worthless. Lol, guess the govt had to do something with their failed ACU pattern! I guess the little BOYS with guns are having a tough time with the truth of what pr#@ks they are. If they were human they should be ashamed of themselves and so should there families.